"We selected G+D Group, a company from Germany, to make the new notes. Both of those two new notes will cost us a total of about Rwf5 billion for the next three years," he said. 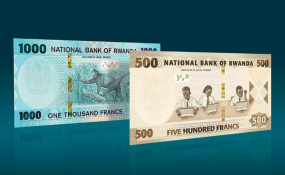 "The Rwf500 and Rwf1000 bank otes had significant similarities, including the colour. Considering the similarities and their quality we preferred to change them. We wanted to make other notes because they were wearing fast since they were issued in 2013," he explained.